Unpopular (but correct) Spiritual opinion: the foundation of all devotion is discipline. The discipline to discern truth from error, and to be vigilant about the decisions we make in our Spiritual and everyday lives. The discipline to keep at our Spiritual practices even when we are not seeing results (yet). The discipline to work at a task we have been given as part of our life purpose, even when it seems daunting. Nothing worthwhile in life was ever achieved without some degree of effort. Look within your soul and ask yourself how, in these coming weeks, you can rise above your limitations and devote yourself to your full potential through the power of self-discipline. I’m saying this because the energies of May are absolutely splendid, and very conducive for attaining our highest good – but this blessing will only come to those who are willing to do what it takes. Let’s get to this week’s reading! 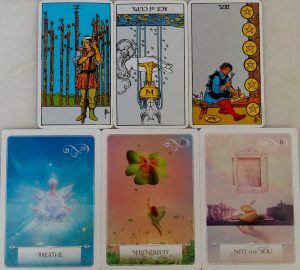 LEFT: NINE OF WANDS. Known as the card of the Wounded Soldier, the Nine of Wands indicates a situation where you’ve pretty much been bashing your head in for a while now, trying to find solutions. When this card appears, take a breather, then try again – and consider different approaches to the issue at hand. Don’t give up. MIDDLE: ACE OF CUPS REVERSED. The card that would have represented some sort of emotional healing and breakthrough is turned on its head this week. Not necessarily a bad thing, just a reminder that we cannot allow our emotions to drive our actions, behaviours, and choices. What you decide, not how you feel, shapes your destiny. Look around you and you’ll probably know some people who allow their egocentric emotions to dictate how they run their lives. Observe objectively – you’ll notice that they’re all miserable. These are the drama queens, control freaks, spoilt brats, and emotional cripples of the world; the people who will never be happy until they grow the f*** up. You, of course, are better than that. Honour your emotions by all means, but understand that success requires the discipline to do the right thing. If you’ve been whining a lot lately, stop it. Put your game face on this week, be brave, and be blessed. RIGHT: EIGHT OF PENTACLES. Focus, focus, focus. The Eight of Pentacles is here to remind you that excellence and mastery begin from the choice to laser in on your task at hand. Nose to the grind now. For those of you who are contemplating (or in the midst of) further studies or some form of skills training, this is a productive week. LEFT: BREATHE. Pace your tasks well. The energies of this week are not going to be the kindest to those who don’t take care of themselves. Be gentle with yourself. Take time out when you need it, because no one else is going to do that for you! MIDDLE: SERENDIPITY. You don’t have to do all the work alone, either – ask the Universe for help, and She will be very glad to give you the assistance you need. When this card appears, the potential for you to step into the flow of Universal blessing + abundance is high. Align your thoughts, desires and choices with Her, and watch the magic unfold. RIGHT: NOT FOR YOU. Say it with me: “Rejection is Divine protection”. If you’re being denied of something, someone, or some circumstance that you’re convinced will be just right for you, this card is here to assure you that you’re actually being kept safe from what might have turned out less than beneficial for you. The form of what you want, or the timing, could be off. Release preconceived notions of what you want for your life – love, success, happiness, etc – and cultivate a radical acceptance of what the Universe can offer. She could be prepping someone or something so much better for you. Trust.